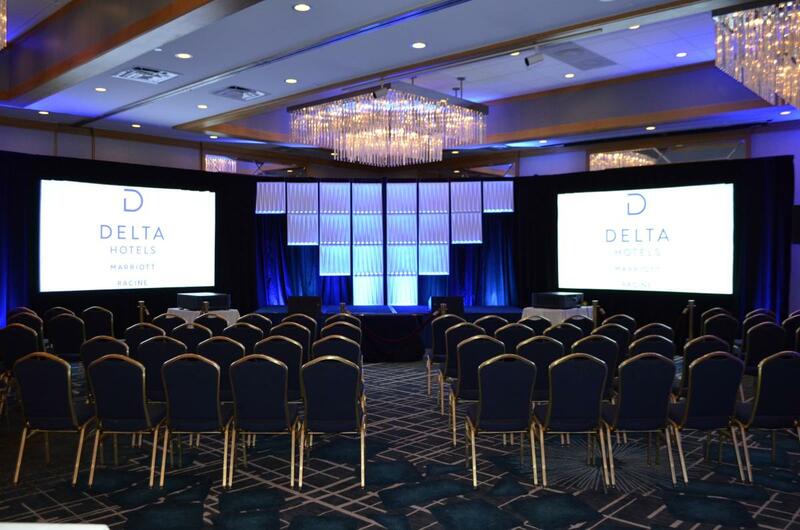 Delta by Marriott - Racine Has 13 meeting rooms totaling 10,000 square feet. The Ballroom has a maximum meeting space of 4,800 square feet with seating for 700. SC Johnson Integrated Manufacturing and Engineering Technology (iMET) Center: Auditorium holds 85. Project Room #1 holds 25 at round tables. Project Room #2 holds 24 at rectangular tables. Computer lab holds 16. Corporate training room holds 13 guests. Charcoal Grill: Private room for 300 with dance floor and bar. EAA Chapter 838: Offers 9,000+ square feet of open space in the museum. The classroom has 930 square feet and seats 70. The lounge is 770 square feet and holds 50 seated and 30 for dining. The outside area is 20,000 square feet. Food staging area available but private catering required. Fountain Banquet Hall: North Hall holds 600 or can be divided into two rooms of 300 each. The South Hall seats 400. Catering available. Hiawatha Bar and Grill: Holds 150 with private service bar/bartender and large dance floor with a stage for DJ. The main upstairs area holds 250. Infusino’s Italian Village: Two banquets rooms can hold 50 to 475. Ample parking. Dance floor with a stage for band/DJ. Catering available. Private bar/bartender. Meadowbrook Country Club: Holds from 15 to 275 for banquet, cocktails, buffet or meetings. Catering available. Mike & Angelo’s Restaurant: Banquet hall holds 200. Racine Moose # 437: Hall holds 200. Catering available. 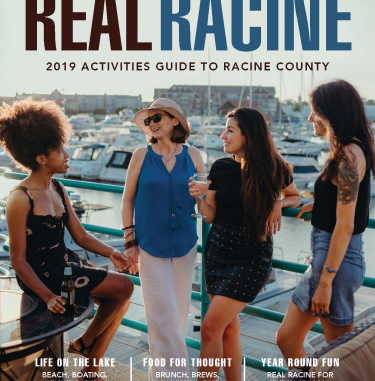 Racine Brewing Company: Holds 80 and can host both large reservations private parties. Racine Theatre Guild: Auditorium holds 378. River Bend Nature Center: the Main lodge holds 126. The cabin holds 60. The kitchen is available with the main lodge. Roma Lodge: Two ballrooms, one holds 325 and can be divided into rooms for 100 or 125. The second hall holds 425. On-site catering and full bar service/bartender. Roundabout Bar and Grill: Private room available. South Hills Country Club: The Vista Room is 4,400 square feet and holds 300 at round tables or 400+ at banquet tables with a three-station bar. Can add 150 guests after dinner. The Festival Room holds 200 at round tables, 250 at banquet tables and has a two-station bar. Can add 75 after dinner. The Pub Room holds 40 for small gatherings. Summit Restaurant: Private room holds 250 with catering available. VFW Hall: Private room available.